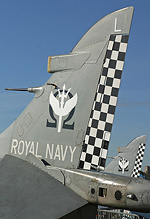 Very few aircraft are etched into the conscience of the British nation. 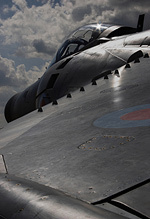 The Spitfire, Concorde, and perhaps the Lancaster are three of a very select band of flying machines. 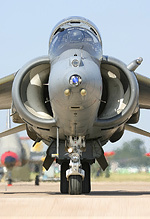 Another, almost certainly, is the Harrier. 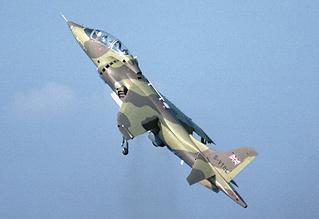 Mention the name to even the most lay of laymen, and you'll get, at the very least, the reply "oh, the Jump Jet". 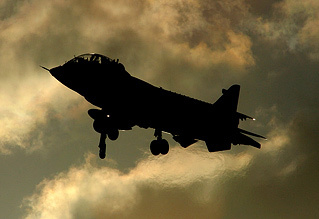 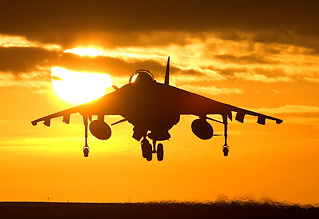 The end of 2010 will see the type vanish from the British military inventory, as the Coalition Government, as part of the plan to get the nation's finances back on an even keel, continues to cut military spending at an unprecedented rate. 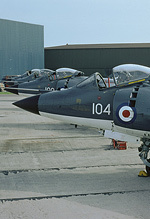 Dan O'Hagan writes the introduction to a special UKAR photographic feature, drawing heavily on access to our membership's superb and unparallelled pictoral archives. 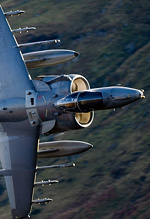 In today's austere society, it might be hard to believe, but there was a time when Britain led the world in aero design. 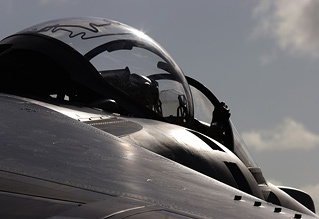 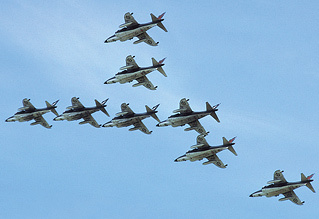 In the post-war years the race was on to develop a fighter aircraft with vertical take-off and landing capabilities. 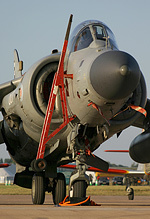 Development of what was to become the Harrier, powered by Bristol's Pegasus engine, began with Hawker-Siddeley as long ago as 1957. 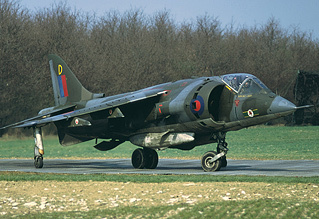 The first flight of the development aircaft, the P.1127 Kestrel was in 1960, demonstrating even at that stage that the British had indeed succeeded where the other nations had failed, in developing viable and reliable VTOL technology. 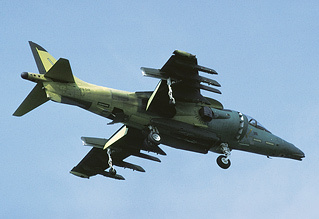 The only other comparable VTOL aircraft to enter service anywhere else in the world was the Soviet Union's dreadful Yak-38 "Forger" which lacked anywhere near the user-friendliness of the British design and was vastly inferior in terms of both range and payload, making the Yak-38 effectively useless as a meaningful warplane. 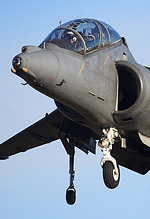 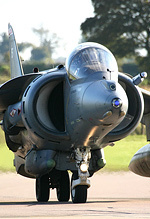 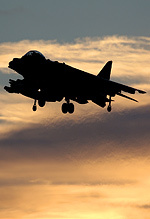 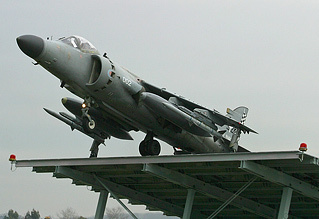 The British aircraft, by now named the Harrier, entered Royal Air Force squadron service as the GR Mk 1 on April 1, 1969. 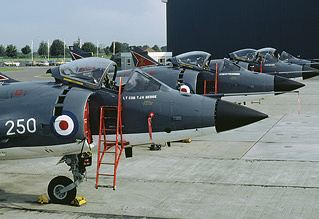 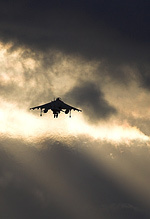 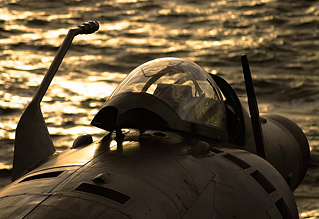 Navalised Sea Harriers followed, and soon the type was a successful export, with Spain, the United States, Italy, India and even Thailand among the customers for the jet in its various guises. 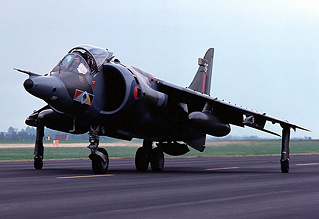 At war, the Harrier has served Britain exceptionally well, with Sea Harrier FRS.1s of the Fleet Air Arm and Harrier GR.3s of the Royal Air Force making a great impact in the Falklands Conflict of 1982. 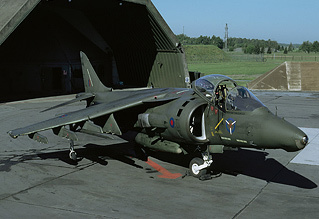 The Sea Harriers alone shot down 20 Argentine aircraft, for the loss of none of their number in air-to-air combat. 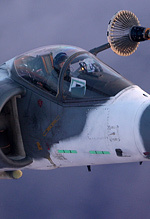 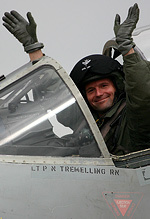 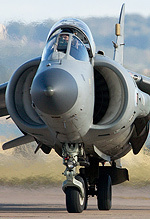 Modern "Harrier II" variants such as the GR.7 and GR.9 have been successfully deployed over the Balkans, Iraq and Afghanistan. 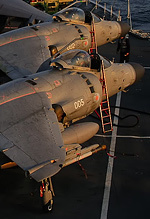 On October 19, 2010 it was announced in the Strategic Defence and Security Review that Britain would retire her remaining Harriers (the Sea Harrier F/A.2s were retired in 2006), bringing to an end the RAF career of the last pure British designed and built front-line fighter aircraft. 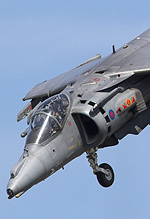 For enthusiasts and general public alike, the Harrier was an assured air display performer. 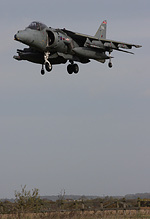 The noisy hover, backwards flight and bow to the crowd routine never failed to excite. 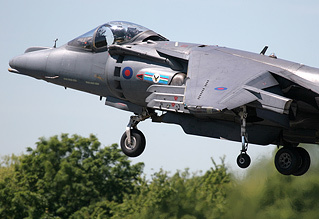 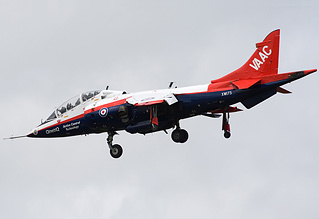 In these days of limited RAF airshow participation, with displays dominated by underwhelming and tame trainer types, the airshow scene will lose a star, as it is highly unlikely that a Harrier will ever be permitted to fly in British skies under civilian ownership and operation. 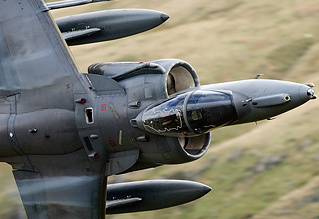 Of course Harriers won't be gone completely from the skies, and who's to say that we shan't see examples of the type flown by other air forces at airshows in the UK. 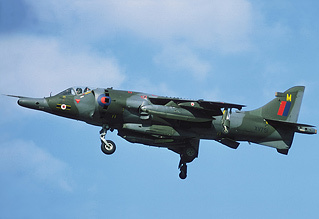 And that might be the most cruel twist of all - an aircraft designed, built and flown by a once world-class military power, a power now so pared-back and withered, that it can no longer afford to operate one of the aircraft that was once one of its most proud and potent status symbols. 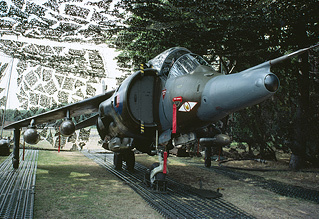 As the British Harriers prepare to be retired from front-line squadrons to scrapyard hulks, or to museum exhibits, UKAR, with a diverse range of images celebrating the type's long and distinguished service career, pays tribute to Britain's last great fighter - the Harrier. 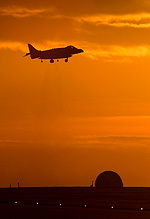 With thanks to Damien Burke, Paul Cameron, Keith Campbell, Pete Fletcher, Michael Hind, Tom Hill, Fred Martin & Lindsay Peacock.